The Mantis family of vehicles is equipped with multi-layered protection including kinetic, blast, NBC and TIC, in addition to dynamic thermal and visible camouflage options. 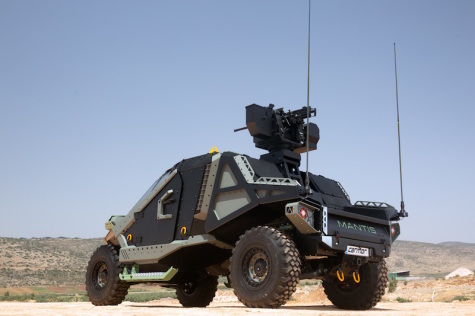 Carmor's vehicles undergo rigorous ballistic testing against mines and improvised explosive devices (IEDs) and meet international standards. The new family of vehicles also includes provision for integrated night vision and surveillance systems and can be fitted with foldable weapon station systems, missile launchers, mortar and turrets etc. Due to their lightweight design and ergonomics, the vehicles deliver a combination of survivability, agility and lethality, presenting optimum automotive performance and multi-mission readiness for any field requirements. Small on the outside, large on the inside, the Mantis Family has four (4) customizable versions for 3, 5, or 8 Passengers, with an option of a scalable flatbed in the rear. Each version can be customized according to requirements. The driver of the vehicle is seated in a cockpit-like position, enabling enhanced field of vision and optimal control of the various digitally displayed systems in the cabin. The Mantis vehicle concept differs from any other known vehicle on the market. Carmor is a leader in the design and manufacture of special-purpose vehicles for military and civilian applications. The company was founded in 1947 and plays a key role in equipping the IDF and civilian units. Carmor manufactures vehicles for NATO and UN forces as well as civilian administrations, HLS, and armed forces around the world. The company designs multi-purpose vehicles with versatile designs, configurations and additional features, as well as customized vehicles.